feipoa wrote: With the Parhelia in the PCI-X slot, the score was 3854. With the Parhelia in the conventional PCI slot, the score was 4580. Any ideas why the score would be higher with the card in the conventional PCI slot? PCI-X like conventional PCI is a shared bus. If the specific PCI-X slot you used happens to be shared by something else on the motherboard (drive controllers and LAN are common) then the full bandwidth is not available to the video card. It is not uncommon for there to be two or even three independent PCI-X buses on a motherboard. If you want to use PCI-X video it would be a good idea to find out which PCI-X bus has the least on it. Manuals for boards with PCI-X usually show what is on what bus in the manual. That is a good point. I no longer recall if I looked into that or not. I did these tests some time ago. Let's assume that the gigabit ethernet adapter and the Matrox graphics card are both on the PCI-X bus. If the ethernet adapter is enabled, but not in use (ethernet cable not plugged in), to what extent does this effect the throughput of the Matrox graphics card? If the terhnet adapter is disabled in the BIOS, to what effect does this have on the Matrox graphics card? If the LAN chip is disabled it won't be using any bandwidth. A little power maybe, but no bandwidth. I recall when using a USB card in my PCI-based 486 system, just having the USB card enabled, although not in use, lowered some benchmark scores by 5-10%. In my above tests, I am fairly confident that I left the gigabit ethernet enabled and was using the onboard SCSI, which may or may not have been on the same bus. It would be interesting to rerun the benchmarks to determine how much bandwidth is consumed for other idle components on the PCI-X bus. Another possibility is that some PCI slots that look conventional are actually 66MHz capable. Those never got super popular but there are some around. Last edited by PCBONEZ on 2016-1-08 @ 09:02, edited 1 time in total. feipoa wrote: I recall when using a USB card in my PCI-based 486 system, just having the USB card enabled, although not in use, lowered some benchmark scores by 5-10%. Makes sense because there is a little chatter between the USB chip and the system even when no USB device is attached. I think most of it is the system checking to see if you just plugged something into USB. How can you pass 64-bits of bus data on a non-PCI-X slot? I thought there were only 32-bit/66 MHz and 32-bit/33 MHz conventional PCI slots? Last edited by PCBONEZ on 2016-1-08 @ 15:05, edited 1 time in total. Last edited by dr.zeissler on 2016-1-08 @ 19:46, edited 1 time in total. It is silent with active cooling. Please note that we don't allow people to sell items on VOGONS. Although this likely didn't come into play in this case, it's important to note that PCI devices which don't support higher PCI-X clocking (66, 100, 133mhz) will limit the speed of the overall bus. This is another reason to pay attention to bus mapping on server motherboards. Would the Windows Device manager tell you which PCI device is on which bus? XP already has "Devices by Connection" in the device manager. idspispopd wrote: Would the Windows Device manager tell you which PCI device is on which bus? XP already has "Devices by Connection" in the device manager. It should. It does for PCI and PCIe. If I can find a hoist big enough to alleviate my rectal cranial inversion problem I'll check tomorrow. Might not work out as all the PCI-X cards I can think of that I have here are 3Ware RAID cards and they don't like to play with the Adaptec RAID in the PCIe slot. This is 1000 points higher in 3dmark and 20fps higher in Q3 compared to my retail version 1 parhelia. I haven't attempted to overclock it yet, but the original parhelia didn't like to OC at all. Apparently this one does. 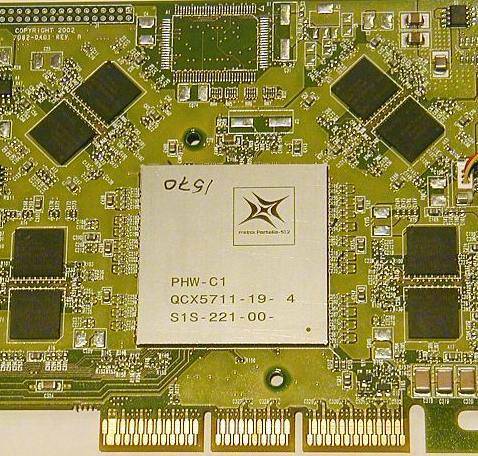 ps another interesting tidbit: using this latest driver and this card, dxdiag reports it as being dx9. But the parhelia was originally shamed for not supporting 9, but 8 only. Last edited by mzry on 2018-2-10 @ 12:04, edited 1 time in total. You cannot assume die size by a package.